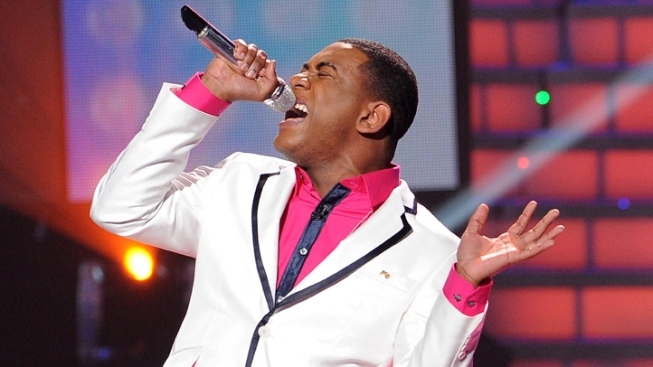 Joshua Ledet Again Earns Rave Reviews on "Idol"
He nearly brought Jennifer Lopez to tears with his rendition of "To Love Somebody"
Ledet wowed them during the 1960s-themed first round with The Temptations' "Ain't Too Proud To Beg." The judges on "American Idol" definitely love somebody, and his name is Joshua Ledet. While the panel lauded each of the five finalists remaining in the Fox singing competition, the judges once again reserved the most praise during Wednesday's installment for the powerful 20-year-old gospel singer from Westlake, La. Ledet wowed the panel during the 1960s-themed first round with The Temptations' "Ain't Too Proud To Beg," and then nearly brought judge Jennifer Lopez to tears with his restrained rendition of the Bee Gees' "To Love Somebody" during the second round of British pop tunes. Randy Jackson, the "Idol" veteran, called Ledet "one of the best singers ever on this show." Lopez took the compliment further, telling Ledet, "I think you're one of the best singers I've seen in 50 years." Hollie Cavanagh, the 18-year-old balladeer from McKinney, Texas, opened the show with a sensational version of Ike and Tina Turner's "River Deep Mountain High," and later dialed it down with the Leona Lewis hit "Bleeding Love." Steven Tyler admitted he wasn't familiar with the chart-topper but insisted that Cavanagh "nailed it." "You've been the dark horse all season," Jackson said. "For me, you're two-for-two tonight." Phillip Phillips attempted a divergent musical strategy, first ditching the melody on The Box Tops' "The Letter," then later crooning it on The Zombies' "Time of the Season." The judges deemed the bluesy 21-year-old pawn shop worker successful on both fronts. "You're so compelling to watch," said Lopez. "I wanna get up on my feet when you're done." Skylar Laine, the 18-year-old country rocker from Brandon, Miss., imbued Creedence Clearwater Revival's "Fortunate Son" with her twangy sensibilities before packing an emotional punch with Dusty Springfield's "Say You Love Me," despite an odd set piece that featured a couple sitting on a fake park bench on stage. "I'm transfixed on everything you're doing," Jackson told Laine. The judges were also taken with Jessica "Bebe Chez" Sanchez, the wannabe 16-year-old diva from San Diego, and her candle-lit version of Joe Cocker's "You Are So Beautiful." Not everyone on the panel was as floored with her prior decision to take on Ike and Tina Turner's "Proud Mary." "It didn't really quite sit with me," lamented Jackson. Between the individual performances, the finalists were divided for a duet and a trio: Phillips and Ledet, which Tyler called "a match made in heaven," paired up for the Rightous Brothers' "You've Lost That Lovin' Feelin'" while Sanchez, Cavanagh and Laine got together for a rendition of Jackie Wilson's "Higher and Higher" that Lopez deemed "so cute." One of the five singers will be eliminated from the competition Thursday.